This entry was posted in Recent Posts and tagged Audrey Dawn, Beach flower, Come on rain, Flowers, Haiku, Nature, Oldest Daughter & Red Headed Sister, Poems, Poetry, Spring, Texas, Texas Beaches, Travel. Bookmark the permalink. I really need to make a better effort of learning how to take a picture. Don’t focus too much on the photo…pretend my words are flailing about saying “Look at me! Look at me!” These pictures are just the proof that I had a source of inspiration. I am glad you liked this poem, Photographer Philosopher Extraordinaire. Thanks!! ( I know, tis why I said that, Duketh.) *laughing* I like that you see it, too. Isn’t she something? We should see if she’s edible! *eats the whole flower* I don’t see why the bees like this. I meant to sign that. I would say that was a marigold. Has a distinctive scent and most insects don’t like it. Now if you like guitar have a listen to Midnight in Manaus from Manaus Where Two Rivers Meet. That is pretty hot. I just looked the marigold flower up. She’s nothing like the ones I grew up seeing. But, I think you’re right, however she is the daintiest marigold I’ve ever seen. Maybe it’s her ocean living…it looks good on her. Thanks for the help. 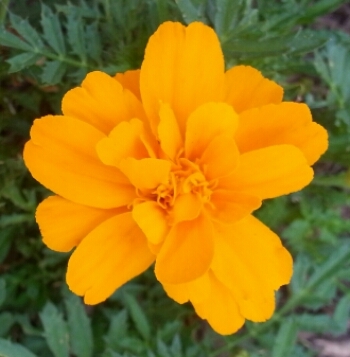 There are many kinds of marigolds. It was the leaf that tipped me off. Also they are usually a yellow/gold colour. Gotcha! Hmm. How was she surviving, I wonder. Poor thing has a fight in her. I like that! I’m glad you found it to your liking, as I know how serious you take your gardening. She spoke to me, you know. She said, “Aud, get busy and do something with your life.” I told her, “I prefer to dance first…” She refused. Isn’t she beautiful? I don’t know. I searched for a picture of it online before I posted the poem. I couldn’t find her anywhere on there. All I know is that she was fighting to grow right by the bay, Monsieur. Oh, I can see the smile, the tease, the hint of a twirl that could come but won’t just yet. Your three lines unleash a summer storm of warmth promised. Hey! On my way out this morning guess what song I heard? Guitarist Big Jim Martin was rockin my windows with Faith No More’s Epic. Know that one? Still fresh all these years later…awesome catch this morning! You chased me to The YouTube (I love feeling out of touch and calling it that) to refresh my memory on Big Jim and FNM’s Epic. Great video from official German version of the lighning and rain and fish flopping around. Big and thick song. Not what I was listening to then, but I do defer to your taste and say it rocked me. Well, I’m glad you found it to your liking. About half way through it comes alive with that guitar. Not into punk rock that much, but this song is a good one. I must now go to The Youtube and watch the video…haha. I’m sure it’s strange. I have no doubt. Where the guitar punches in, Audrey, if that hadn’t happened just then, I wouldn’t have kept watching. So, yes, it came alive. Good call. Haha. Did you watch the video in German? I gotta tell ya, I turned it off after about 3 seconds. Watch an American video of the song and only sat through 7 seconds…wow. One of those…best if heard on the radio songs. I watched the one on The YouTube that was in English but German label, official verson. Ahh, well still…same thoughts remain. I am a radio guy, XM satellite in my car. I like Deep Cuts, 70s, The Highway … And The Blend so I can hear pop songs of today. Also Bruce E Street station. I like channel 39…big hair bands of the 80s and 90s. I like those you mentioned, as well.